* Gulf Views from 6th Floor Balcony! You'll never want to leave the Palms of Destin! Stay here for a true 'resort' experience. Palms Resort #1614 is a Junior 2BR/2BA, which is a 2 bedroom with a full-sized master plus a smaller bedroom, and two full bathrooms, one with a walk-in shower. The master has a king sized bed with flat screen TV. The second bedroom has custom built full size bunk bed with 2 full beds, flatscreen TV's and its own bathroom entry! This gorgeous condo sleeps 6 comfortably! Adorable custom furnishings personalize this condo. A flat screen TV in the living area and your own washer & dryer complete this beautiful unit. 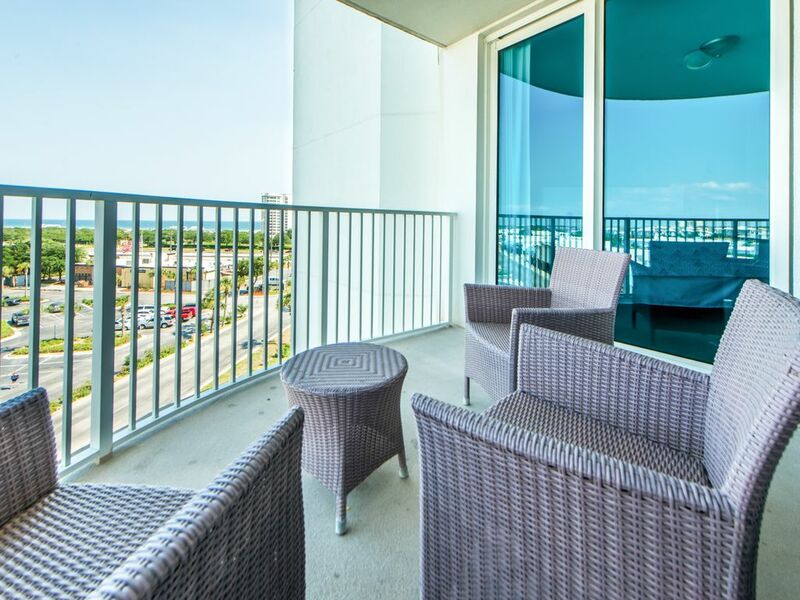 Start off your vacation every morning by enjoying the breathtaking Gulf Views from the spacious balcony! Under age groups will be allowed at our discretion. Real Joy Vacations manages properties to fit all budgets! Whether you are looking for a beachfront location, a luxury home with a private pool, or would like a budget-friendly, walk to the beach option, we have properties in all shapes and sizes! Most of our properties come with the Real Joy Fun Pass, which gives you one or two free tickets to daily attractions each night of your stay along with unlimited DVD rentals. Our offerings are fantastic for families because they give you room to spread out. With substantially more space than the average hotel room, most of our properties offer separate living areas, full kitchens, and washer/dryers. Our guests can cook their own meals if they wish and launder their things if needed. You can count on the Real Joy team��s extensive property management experience. From our excellent customer service reps to our cleaning crew, we want you to have a wonderful stay. It was my families first time to Destin, FL and our first time staying at The Palms. We loved the area, the resort and Destin. We did mention the condo was not as clean as we would have liked it, but they responded promptly and asked us if we had other concerns. We do wish there were better instructions especially for first timers like us. But over all we had a wonderful time and we are very happy with our stay! Hi Shannon, thank you for your feedback on this lovely condo. We are so glad your first trip was with RealJoy and that we were responsive to your concerns. We apologize for any inconvenience and we do see that we addressed them promptly. Again, thank you for your input and choosing RealJoy for your stay! Hi Rebecca, thank you for your feedback on your stay at this lovely condo. We’re happy to hear you found the unit clean and we hope you enjoyed the awesome lagoon pool. Thank you again for your feedback and thank you for staying with Real Joy! washer/dryer was shaking our hole condo at 12:30 am. So bad that we had to find someone to go up there. Hi Arwen, thank you for taking the time to leave us a review of your stay. We hope you enjoyed the many amenities offered by the Palms and the awesome lagoon pool. We would like to apologize for the inconvenience you experienced here. Again, thank you for your feedback. Perfect condo for a family of four. Clean and convenient! Pools were great, close to everything, would definitely return. Hi Amy, thank you for your feedback on your stay at this lovely condo. We’re happy to hear you found the unit clean and convenient and found the pools great. Thank you again for your feedback and thank you for staying with Real Joy! The place was really clean & nice. Only thing was couldn’t get the tv’s in bunk bed room working. Other then that everything was perfect. The pool area is amazing. Very nice place , friendly staff. The beaches are amazing there. Hi Shana, thank you for your feedback on this awesome condo! We are glad to hear you enjoyed the beautiful beaches, and the lagoon pool during your stay. We apologize for the faulty TV's in the bunk room, but will make sure to get them fixed for future guests to enjoy. Thank you again for the feedback on your stay, and for choosing Real Joy Vacations! I would have liked to be able to have my drink while sitting hot tub. Rule is: No drinks within 6ft of pool. But, it didn't ruin my vacation. I would still consider staying again. Hi Robert, thank you for your feedback on this lovely condo! We are glad to hear you enjoyed the hot tub, and the lagoon pool at this awesome resort. All of us at Real Joy also love to have our drinks while relaxing in the hot tub, but sadly, safety takes precedence for us and all of our guests. Thank you again for your feedback, and for choosing Real Joy Vacations!